BOL! We love your costume! That's a great costume! Bettina would HATE it. Oh, what a great costume!! Happy WW! Cute! It's a real watchdog!!! Looks like a Rolex. I think its time for a walk and a Treat! Always good to carry a watch so you know when to remind the humans about dinner time! What a cute watchdog! :) Happy Wordless Wednesday! That costume is genious, Carrie! Got to love a great halloween costume!! Might just be the cutest wristwatch I've ever seen! 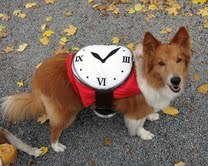 Cute costume - a watchdog! I love it what a creative costume. Your mom is so funny. Watchdog, BOL.